Xiaomi has announced the next version of its custom Android interface, called MIUI 10. The announcement was made yesterday in China by the Co-Founder and Senior Vice President of Xiaomi, Hong Feng. Besides the name, the company didn’t reveal much else about the new interface. However, Gizchina reports that the company will focus on artificial intelligence and machine learning with this version of the OS. 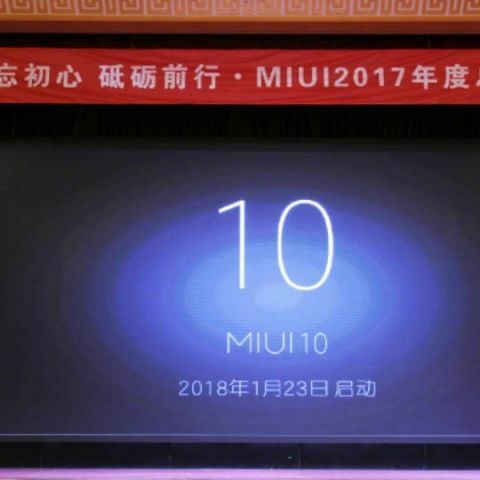 A few days ago, Xiaomi had announced that the latest version of its interface, MIUI 9, would start rolling out to 40 of its devices. This includes devices like the Xiaomi Mi 2 which were launched back in 2012. However it should be noted that MIUI 9 is based on Android Nougat and not Android Oreo. Huawei’s latest UI, EMUI 8 also comes with AI-based capabilities. These includes AI-powered real-time scene and object recognition, and AI Accelerated Translator and more. Further the company also stated that it can also intelligently allocate resources in order to provide more space and ensure a smoother experience. Further, EMUI 8 is based on the latest version of Android, Oreo. The company had initially confirmed that it would start rolling out EMIUI 8 to Honor 8 Pro, Honor 9i, Honor 7X, and Honor 8 Lite smartphones. It should be noted that the company’s previous flagship, the Honor 8 is missing from the list. However, since then , the company has slighty shifted its stance, and told Android Police the phone will get the features of EMUI 8, but not Android Oreo. The PR representative also noted that that further details will be released within a week. why RAM is not come in 10+ GB? When will Xiaomi Mi3 come back agian on Flipkart?